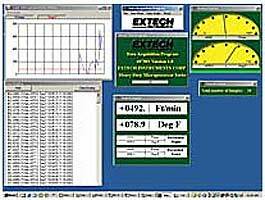 This data acquisition software for use with the Extech heavy duty series. With this software, users can capture, display and store readings on a PC. This software allows data to be imported into Lotus or Excel. Sampling time is fully adjustable from 1 seconds to 60 minutes. WindowsÂ® 95/98/NT/2000 compatible software on CD-ROM and serial cable is included.